Hide deals from seller "GNC Bartlett & Glen Ellyn"
Hide deals from category "Nutritionists"
Limit 1 per person. Valid toward any merchandise. Valid at listed Bartlett and Glen Ellyn locations only. Full value of Gift Certificate must be used in 1 visit. 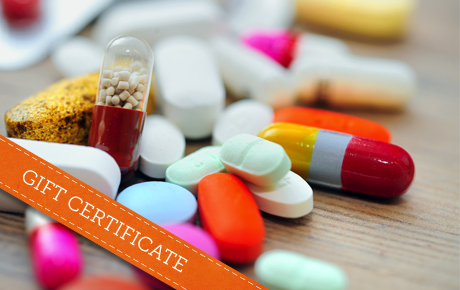 Stock up on your favorite vitamins, supplements and more with 50% off a $20 Gift Certificate to GNC in Bartlett and Glen Ellyn. These one-stop nutrition shops provide everything you need to maintain your physical and mental well-being. Ginny, owner of the GNC stores in Bartlett and Glen Ellyn, has a master's degree in nutrition and a genuine passion for helping others reach their health goals. The family-owned shops have been in business for 17 years, and they are dedicated to providing customers with superior service. GNC carries an impressive variety of health products ranging from vitamins and supplements to protein shakes, herbal remedies and beauty products. Personal coaches are also available at these locations to provide even more guidance. A health store in Bartlett and Glen Ellyn offering vitamins, protein shakes and more.